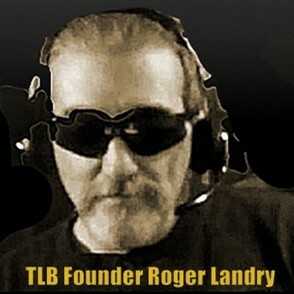 Authors Preface: The following is a composite of recent information and excerpts from several past articles I have published on TLB. There is also a plethora of additional links for reference and continued research below this article. What you are about to see are multi-media examples (print & video) showing the absolute danger associated with the GMO foods we eat. The irrefutable dangers associated with the bio-toxins sprayed on these GMO crops (glyphosate). The atrocious propaganda associated with the Biotech Industry that profits from these dangerous foods … As well as the complicity of a government tasked with our protection. GMOs (genetically modified organisms) are a nightmare and a serious threat to humanity! Congress and our government in total, continue to ignore our requests (demands) for research and investigations into the health risks of GMOs, even ignoring petitions with over a million signatures just to institute labeling requirements. WAIT I thought they worked for us? Meanwhile a growing number of nations (including countries like Peru, Russia, India, etc…) restrict or outright ban them as hazardous to their citizens health. I have NEVER seen more propagandized bull-crap relating to organic food in my entire life! The saddest part of this is that far too may of the uninitiated (ignorant of the facts) will watch this … and believe it !!! Today farmers are forced to use patented GMO seeds to be competitive and not permitted to even save their own seeds for use or are sold what are appropriately named “Terminator Seeds”! GMO based companies like Monsanto even hire jack boots (see links below article) to enforce their patent and contractual requirements. But if a farmer speaks out on issues such as pigs going sterile, or into false labor while being fed GMO corn to the ruin of a farmers livelihood, they are threatened with huge law suits and prison time! 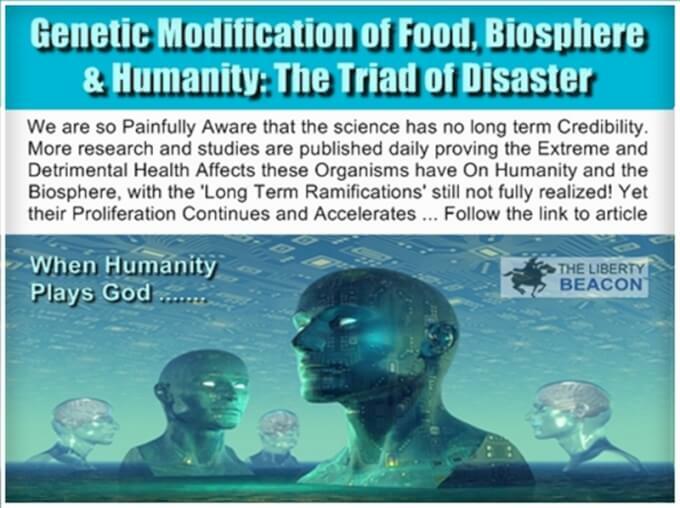 I have stated on many occasions that GMOs are a mechanism (one of several including vaccines) of an elite caste to cull the herd … to facilitate a reduction in global population via a vital mechanism we have less control over with every passing day … our food. Please watch this video for a clearer understanding of why I continue to make these claims. Feeding GMO soy to infants my be fatal, eating GMO corn linked to a fatal lung disease, eating GMO wheat may destroy your liver (see links below article)! Our government provides free formula to underprivileged infants (WIC program, about 2 million a year), but only GMO brands …REALLY, why? According to very convincing research (done outside the USA) well over 2 million deaths in the US are as a result of GMOs since 2008 … that number again is OVER TWO MILLION and that may just be the very tip of the proverbial iceberg! Americans are sicker than at any point in our history with disease, cancers and other miladies at an all time high! This is a fact stated by our own government and tracked by the CDC. The most alarming aspect of this is that a serious upswing in this trend just happens to coincide with the introduction and rise of GMOs in our diets, and no red flags have gone up? This is well past the stage where we are being used as lab rats and hearkens onto something much more sinister. Sterility is also soaring in America and our government says it does not have a clue why! It is a well known and documented fact that a biotech company Epicyte (in conjunction with the US government) patented a genetically modified corn that causes the host body to produce antibody’s to sperm, rendering males who eat it sterile, and women who eat it … killers of sperm. 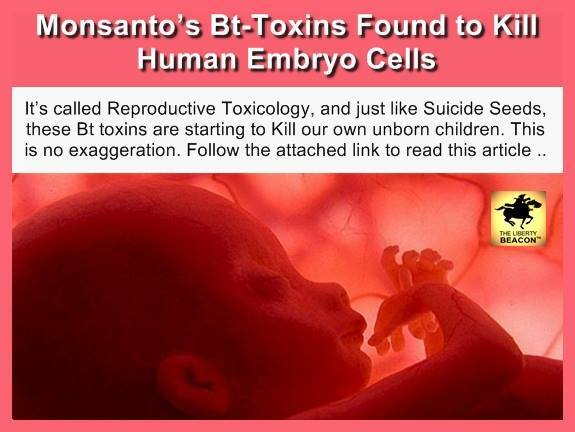 This research was then purchased by biotech giants Monsanto and Bayer … for WHAT ?? Yet if you try to find out if the corn you are eating is Epicyte modified, or in fact if any of the GMO food you are exposed to has this gene incorporated into it … that request for information is ILLEGAL! … REALLY? … WHY ??? Have you ever heard of “Horizontal Gene Transfer”? There is emerging research that is leading researchers to believe (with verifiable evidence) that the consumption of genetically modified foods can influence our genetic makeup … our DNA! The biggest issue with this concept is that once our DNA is altered we pass these modified genes on to all our children … Are these changes to our genetic makeup good or destructive? No one knows, and only future generations will answer this question. Try to guess how many of the ruling elitist caste … eat GMO foods (Zero to Zilch). If this is not the scariest concept you have been made aware of … you need psychiatric help! 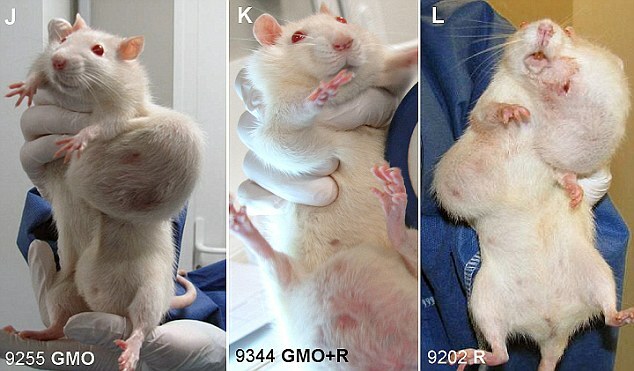 We have available to us considerable major research such as the Seralini study (falsely defamed then reinstated under pressure from well over a thousand scientists from across the planet) showing lab rats fed GMOs developed massive cancerous tumors, and by the third generation were sterile (see links below article). Now well over 80% of all the foods we eat in America contain some GMOs or biotoxins such as the biotoxic GE herbicide Glyphosate. So why is the sterility rate soaring? Seams like one possible reason is a no brainier to me … yet our government cant figure it out, REALLY ??? Just how complicit are our leaders, those elected or appointed to protect us and look after our health? How far up the political food-chain does this corruption go? We just rid ourselves of a lying president who campaigned on the promise of getting GMOs in our food labeled stating on numerous whistle-stops “People have a right to know what is in the food they are eating”. 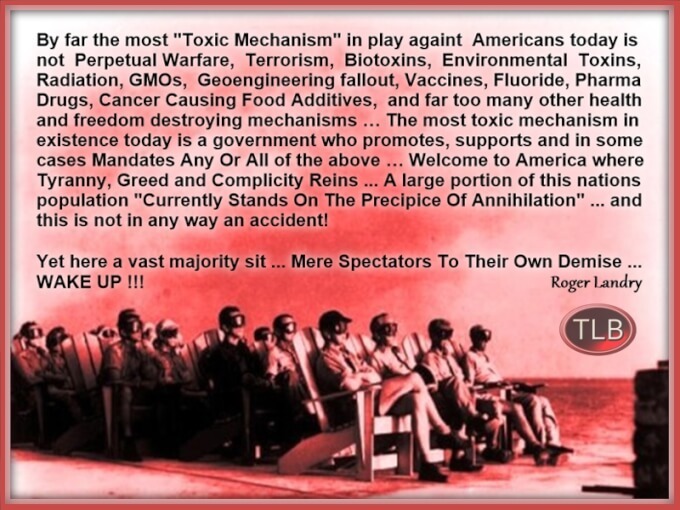 Yet once he got into office … FULL REVERSE … all promised was immediately forgotten and he in fact (for 8 years) filled the role as “Lobbyist In Chief” for the biotech industry (special emphasis on Monsanto) and even signed into law the DARK Act.. 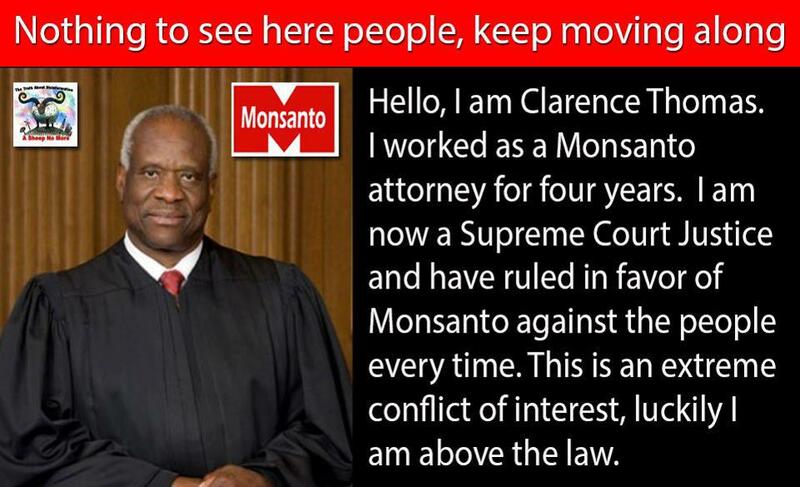 This was the same president who appointed a Monsanto VP as his Czar to the FDA (a HUGE red flag and conflict of interest), a Supreme Court Judge and ex-lawyer of Monsanto rules in their favor 100% of the time with not even recusing himself once (another huge conflict of interest). It would seem the power, influence and control of the biotech giants is almost (but not quite) absolute in America. Monsanto, Bayer, and other Biotech companies have one of the strongest lobbies on Capitol Hill and what their funding of campaigns and influence pedaling amounts to, is a multi-million dollar attack on We The People every year! Just one biotech company (Monsanto) has spent as much as $43 million on defeating a labeling bill in just one state (California), and if you add up all the money the biotech industry has spent over the last decade defeating labeling bills or lobbying our greedy and complicit leaders, the total is well into the billions of dollars. Either the profit is well worth the expenditure (cost of doing business), or the goal is … something much more sinister. Some additional applicable references/articles … there are thousands more! GMOs & Rising Infertility, THIS IS NO ACCIDENT!